The Lou Wise Oblique Airphoto Collection is a large collection of oblique airphotos held at the York University Clara Thomas Archives and Special Collections. The photographs were taken in the 1980s and 1990s and cover conservation lands, wetlands, the Oak Ridges Moraine, and geographical areas that were considered to be “at risk” for redevelopment. 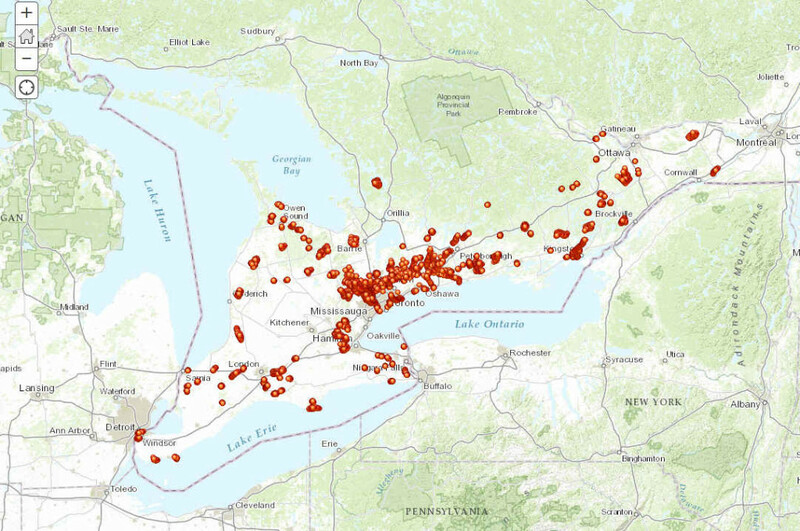 Our collection consists of 5989 airphotos covering a large swath of Southern Ontario. 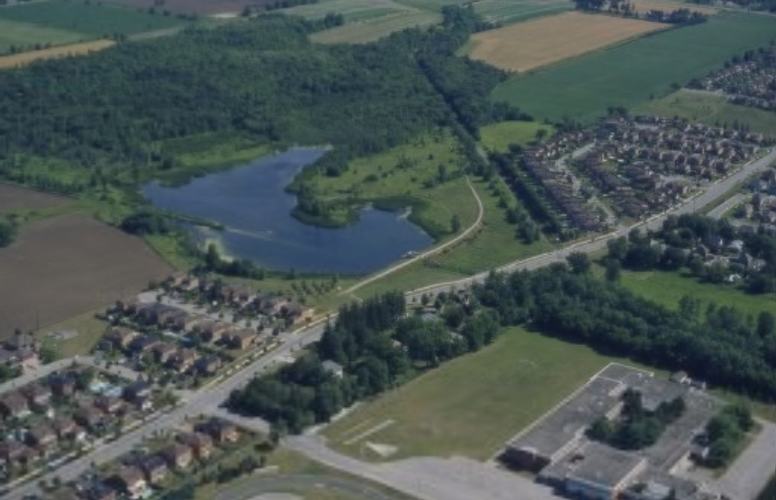 Oblique aerial view of Ponds at Stouffville Conservation Area. [ASC26181]. Lou Wise fonds. Clara Thomas Archives and Special Collections. Copyright of all original photographs in the Lou Wise Oblique Airphoto Collection is retained by Lou Wise. Individuals or organizations interested in reusing or reproducing these images must contact Lou Wise for permission. For further copyright information and contact information please email: ascproj@yorku.ca. You can view the finding aid of Lou Wise’s archival material held at York University’s Clara Thomas Archives & Special Collections here. You can view and browse the digitized collection by geographical names and photo title, as well as viewing the collection via an interactive map or via a KMZ layer in Google Earth. You can access the collection via York University Digital Library. You can browse the collection by the photo title, region (Conservation Authority), County (Regional Municipality), and Municipality. As of March 2016, 5767 photos have been geographically located, and each detailed record permits you to view the location of the photo in Google Maps and Open Streetmap. It is important to note that we have yet to determine the geographic location of approximately 200 photos, so at this time these photos only have a sparse description. To date we have determined the locations of 5767 oblique air photos. You can browse the collection via an interactive map. Interactive Map showing the location of 5767 air photos in the Lou Wise collection. Each point (marker) represents the location of a photo in the collection. Zoom into the part of Southern Ontario that is of interest, click on a marker, and you will be able to access information about the photo. You will also be able to access the full description of the photo and a low resolution version of the photo. This project was made possible through the cooperation of archivists, librarians and staff at the Scott Library’s Bibliographic Services, the Map Library and the Clara Thomas Archives & Special Collections who arranged and described and digitized each photographic slide, assisted by Wise’s original annotations. The project also benefited from a Young Canada Works Grant in 2012, administered by the Canadian Council of Archives which allowed the university to hire a contract digitization assistant, Craig Butosi to identify and plot individual images. The project continued through 2012 2013, and 2015 with several undergraduate student assistants from the Map Library who continued the meticulous work of identifying precise locations for historical photographs and attributing latitude and longitudinal information to the digital object. Project team managers estimate that this project has taken over 2,500 hours to digitize, describe, geo-locate and generate useful metadata for about 5,800 images over five years. Nick Benko, Craig Butosi, Marissa Chase, Ling He, Julia Holland, Rehan Khan, Andrea Kosavic, Prathna Lor, Michael Moir, Janet Neate, Rosa Orlandini, and Anna St.Onge.